What differentiates this blog with the others is that this thing doesn’t seem to have an ending. I’m done not having control over this situation, so I’m taking matters into my own hands. 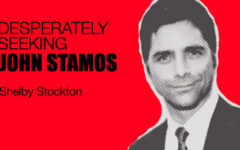 Desperately Seeking John Stamos is coming to an end. A big end. Not one to completely throw in the towel without making a big to-do, I will end this blog thusly. 2) It will be a musical adventure, chronicling the ins and outs of benign celebrity stalking. Did I mention the singing and dancing? 3) At the end of the performance, the last number will be determined by Stamos’s attendance or no-show. It’s a choose your own adventure stage piece! 4) This performance will take place in the fall because I need time to write it, and nobody is here over the summer. That’s all I have. Time to write, plan, document, and promote. I’ll keep you apprised.